Many congratulations to Bill Grayson, who was presented with the Bittern Award at the Arnside & Silverdale Area of Outstanding Natural Beauty’s (AONB) conference. The Bittern Award is given annually to recognise a person or organisation who has made an outstanding contribution to Arnside & Silverdale AONB. Bill has worked for 25 years as a conservation grazing farmer in Arnside & Silverdale AONB, and set up the Morecambe Bay Conservation Grazing Company. Conservation Grazing benefits the special landscape and rare wildlife that the area is so famous for. Native species that evolved when farming was less intensive benefit from sensitive grazing regimes that allow herbs, wildflowers and butterflies to thrive. As the animals graze across the landscape they create a diverse mosaic of different sward heights, bare ground, glades and gentle woodland edges. Bill uses native rare-breed cattle and rears them to become calm, contented animals all of which he knows individually, many of them by name. 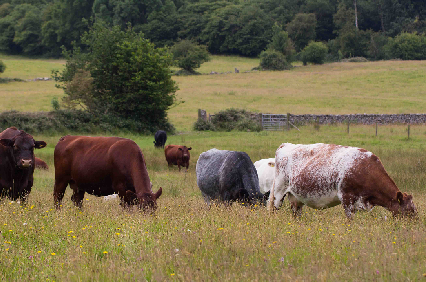 Getting the right grazing balance to ensure that the landscape reaps maximum benefits is an inexact science and requires careful management and understanding, a skill Bill possesses in spades, having worked hard to develop it over many patient years. The animals benefit from being outdoors, year-round, ranging at will, and free from the stresses and potential injuries sometimes associated with being housed for long periods over winter. Their diet mainly comprises fresh pasture containing a wide variety of plant species from which they are free to choose for themselves, rather than being restricted to eating fermented silage with far fewer species. This species-rich diet in turn produces excellent quality meat. Bill has ensured that Lancashire and Cumbria are trailblazing areas for conservation grazing and ensures his expertise is being passed on through his apprenticeship scheme. Successful graduates of the apprenticeship scheme include David Corrie-Close who is the co-founder and director of the Horned Beef Company which grazes Arnside Knott, the slopes of the Howgills and as far north as Penrith and were recent finalists at the British Farming Awards. Bill has also worked with Lancaster University biological and environmental science students trying to teach young people about the principles of conservation grazing, whilst at the same time helping to inform land-owners such as the Silverdale Golf Club about the benefits of organic practices. Bill came to Silverdale as the tenant-grazier for National Trust Arnside & Silverdale at Bank House farm 25 years ago. He attained the organic grazing certification for the National Trust properties in the area before setting up the Morecambe Bay Conservation Grazing Company, which now grazes additional sites beyond the AONB, extending as far afield as Whitbarrow Scar, Dalton Crags and Ingleborough.